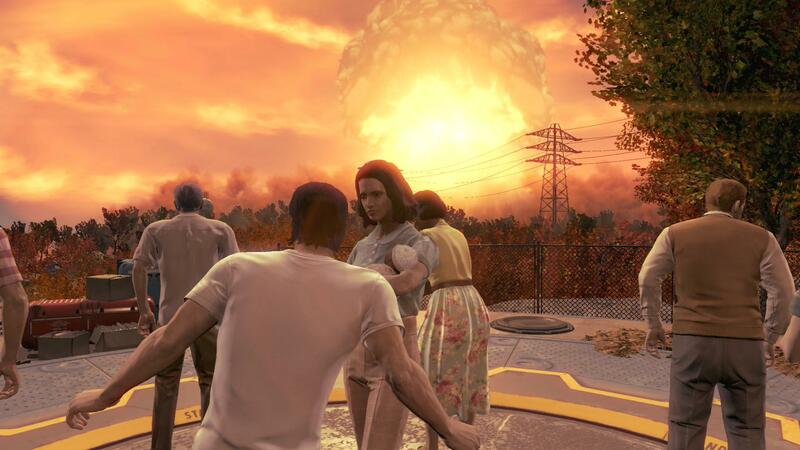 Leaks for Fallout 4 have been pouring in for a few days, with more breaking out only moments ago. Many have managed to get their hands on the game before next week’s launch. A lot of whom decided to share their experience with the world and have so far leaked numerous in-game screenshots, videos of the game as well as information detailing many gameplay aspects and in-game mechanics. The latest rounds of leaks include the full map of Fallout 4’s vast open world as well as information detailing every single perk and perk rank in the game. So without any further delay let’s get into the latest leaks. We’ve made sure that there are no story spoilers ahead, however there’s a lot of information detailing various gameplay mechanics and overall impressions of the game as well as a boatload of screenshots. If you want to check out the two earlier massive fallout 4 leaks containing 57 screenshots in total and a huge amount of information detailing various in-game aspects pertaining to Combat, Settlements, Difficulty Levels, Weapons, Power Armor, Lock-picking, Hacking, Dialogue, Animations, Cover System, Stealth and more you can find it all here and here. Several Fallout 4 gameplay videos with more than 35 minutes of total gameplay time were uploaded to vid.me and posted by a reddit user. This is a list of all the Fallout 4 perks, below this list you will also find tables detailing the different ranks of each Perk. Compiled on the Fallout 4 wikia page. Iron Fist 1 STR 1 Channel your chi to unleash devastating fury! Punching attacks do 20% more damage to your opponent. 2 STR 1, LVL ? Punching attacks now do 40% more damage and can disarm your opponent. 3 STR 1, LVL ? Punching attacks now do 60% more damage. Unarmed Power Attacks have a chance to cripple one of your opponent’s limbs. 4 STR 1, LVL ? Punching attacks now do 80% more damage. Unarmed Power Attacks have an increased chance to cripple one of your opponent’s limbs. 5 STR 1, LVL 46 Punching attacks now do double damage. Criticals in V.A.T.S. will paralyze your opponent. Big Leagues 1 STR 2 Swing for the fences! Do 20% more melee weapon damage. 2 STR 2, LVL ? You now do 40% more melee weapon damage and gain a chance to disarm your opponent. 3 STR 2, LVL ? You now do 60% more melee weapon damage and gain an increased chance to disarm your opponent. 4 STR 2, LVL ? You now do 80% more melee weapon damage and hit all targets in front of you. 5 STR 2, LVL 42 You now do double damage with a melee weapon, and gain a chance to cripple your opponent, or grand slam their head clean off! Armorer 1 STR 3 Protect yourself from the dangers of the Wasteland with access to base level and Rank 1 armor mods. Blacksmith 1 STR 4 Fire up the forge and gain access to base level and Rank 1 melee weapon mods. Heavy Gunner 1 STR 5 Thanks to practice and conditioning, heavy guns do 20% more damage. 2 STR 5 Heavy guns now do 40% more damage, and have improved hip fire accuracy. 3 STR 5 Heavy guns now do 60% more damage. Hip fire accuracy is increased even more. 4 STR 5 Heavy guns now do 80% more damage and have a chance to stagger your opponent. 5 STR 5 Heavy guns now do double damage. 2 STR 6, LVL 10 You now have +50 to carry weight. 3 STR 6, LVL 20 When overencumberred, you can use Action Points to run. 4 STR 6, LVL 30 When overencumbered, you can fast travel. Steady Aim 1 STR 7 Stay on target! Hip-fire accuracy is improved when firing any gun. 2 STR 7, LVL 28 Hip-fire accuracy is improved even more when firing any gun. Basher 1 STR 8 Get up close and personal! Gun bashing does 25% more damage. 2 STR 8, LVL 5 Gun bashing now does 50% more damage and possibly cripples your opponent. 3 STR 8, LVL 14 Gun bashing now does 75% more damage and has an increased chance to cripple your opponent. 4 STR 8, LVL 26 Gun bashing does double damage and has an increased chance to cripple your opponent. It may also inflict a Critical Hit. Rooted 1 STR 9 You’re part tree! While standing still, you gain +25 Damage Resistance and your melee and unarmed attacks deal 25% more damage. 2 STR 9, LVL 22 While standing still, you now gain +50 Damage Resistance and your melee and unarmed attacks deal 50% more damage. 3 STR 9, LVL 43 While standing still, you may automatically disarm enemies that use melee weapons against you. 3 STR 10, LVL 50 Sprinting into enemies while wearing Power Armor now causes massive damage and knocks them down. Impact landing near enemies inflicts even more damage. Pickpocket 1 PER 1, LVL ? Your quick hands and sticky fingers make picking pockets 25% easier. 2 PER 1, LVL ? Picking pockets is now 50% easier. You can place a live grenade in a person’s inventory. 3 PER 1, LVL ? Picking pockets is now 75% easier, and you can steal equipped weapons. 4 PER 1, LVL ? Picking pockets is now twice as easy, and you can steal equipped items. 2 PER 2 Attacks with non-automatic rifles do 40% more damage and ignore 15% of a target’s armor. 3 PER 2 Attacks with non-automatic rifles do 60% more damage and ignore 20% of a target’s armor. 4 PER 2 Attacks with non-automatic rifles do 80% more damage and ignore 25% of a target’s armor. They also have a slight chance of crippling a limb. 5 PER 2 Attacks with non-automatic rifles do double damage and ignore 30% of a target’s armor. They also have a slightly higher chance of crippling a limb. Awareness 1 PER 3 To defeat your enemies, know their weaknesses! You can view a target’s specific damage resistances in V.A.T.S. Locksmith 1 PER 4 Your nimble fingers allow you to pick advanced locks. 2 PER 4, LVL ? You can pick Expert locks. 3 PER 4, LVL ? You can pick Master locks. 4 PER 4, LVL ? Your bobby pins never break during lockpicking. Demolition Expert 1 PER 5 The bigger the boom, the better! Your explosives do 25% more damage, and you can craft explosives at any Chemistry Station. 2 PER 5 Your explosives do 50% more damage, and grenades gain a throwing arc. 3 PER 5 Your explosives do 75% more damage and affect a larger area. 4 PER 5 Your explosives now do double damage. Mines and grenades shot in V.A.T.S explode for double damage, too. Night Person 1 PER 6 You are a creature of the night! Gain +2 to Intelligence and Perception between the hours of 6:00 p.m. and 6:00 a.m.
2 PER 6, LVL 25 You now have +3 to Intelligence and Perception between the hours of 6:00 p.m. and 6:00 a.m., and night vision when sneaking. Refractor 1 PER 7 You must be part mirror! Instantly gain +10 Energy Resistance. 2 PER 7, LVL 11 You now have +20 Energy Resistance. 3 PER 7, LVL 21 You now have +30 Energy Resistance. 4 PER 7, LVL 35 You now have +40 Energy Resistance. 5 PER 7, LVL 42 You now have +50 Energy Resistance. Sniper 1 PER 8 It’s all about focus. You have improved control and can hold your breath longer when aiming with scopes. 2 PER 8, LVL 13 Non-automatic, scoped rifles have a chance of knocking down your target. 3 PER 8, LVL 26 Non-automatic, scoped rifles gain +25% accuracy to head shot in V.A.T.S. Penetrator 1 PER 9 There’s no place to hide! In V.A.T.S you can target an enemy’s body parts that are blocked by cover, with a decrease in accuracy. 2 PER 9, LVL 28 In V.A.T.S when you target an enemy’s body parts that are blocked by cover, there is no decrease in accuracy. Concentrated Fire 1 PER 10 Stay Focused! In V.A.T.S every attack on the same body part gains +10% accuracy. 2 PER 10, LVL 26 In V.A.T.S every attack on the same body part gains +15% accuracy. 3 PER 10, LVL 50 In V.A.T.S every attack on the same body part gains +20% accuracy and does 20% more damage. 2 END 1 You now have +20 damage resistance. 3 END 1 You now have +30 damage resistance. 4 END 1 You now have +40 damage resistance. 5 END 1 You now have +50 damage resistance. Lead Belly 1 END 2 Your digestive tract has adjusted to the weirdness of the Wasteland! Take less radiation from eating or drinking. 2 END 2 You take even less radiation from eating or drinking. 3 END 2 You take no radiation from eating or drinking. Lifegiver 1 END 3 You embody wellness! Instantly gain +20 maximum Health. 2 END 3, LVL 8 You instantly gain another +20 maximum Health. 3 END 3 You instantly gain another +20 maximum Health, and slowly regenerate lost Health. 2 END 4 You gain complete immunity to chem addiction. 2 END 5 You become totally undetectable while submerged. Rad Resistant 1 END 6 Exposure to the Wasteland has made you more resilient, instantly granting +10 Radiation Resistance. 2 END 6, LVL 13 You now have +20 Radiation Resistance. 3 END 6, LVL 26 You now have +30 Radiation Resistance. Adamantium Skeleton 1 END 7 Your skeleton has been infused with indestructible metal, reducing limb damage by 30%. 2 END 7, LVL 13 Your limb damage is now reduced by 60%. 3 END 7, LVL 26 Your limb damage is completely eliminated. Cannibal 1 END 8 Feast on mortal flesh to heal your wounds! Eating human corpses restores Health. 2 END 8, LVL 19 Eating Ghoul or Super Mutant corpses restores Health. 3 END 8, LVL 38 Eating human, Ghoul or Super Mutant corpses now restores a significant amount of Health. Ghoulish 1 END 9 Sure, you’re still human – on the outside! Radiation now regenerates your lost Health. 2 END 9, LVL 24 Radiation now regenerates even more of your lost Health. 3 END 9, LVL 48 Radiation now regenerates even more of your lost Health, and some Feral Ghouls will randomly become friendly. Solar Powered 1 END 10 Catch some rays! Gain +2 to Strength and Endurance between the hours of 6:00a.m. and 6:00p.m. 2 END 10, LVL 27 Sunlight slowly heals your radiation damage. 3 END 10, LVL 50 Sunlight slowly regenerates your lost Health. Cap Collector 1 CH 1 You’ve mastered the art of the deal! Buying and selling prices at vendors are better. 2 CH 1 Buying and selling prices of vendors are now much better. 3 CH 1 You can now invest a total of 500 caps to raise a store’s buying capacity. Lady Killer / Man Hunter 1 CH 2 You’re charming… and dangerous. Men/Women suffer +5% damage in combat, and are easier to persuade in dialogue. 2 CH 2 Men/Women now suffer +10% damage in combat, and are even easier to persuade in dialogue. They are also easier to pacify with the Intimidation perk. 3 CH 2 Men/Women now suffer +15% damage in combat, and are much easier to persuade in dialogue. They are now even easier to pacify with the Intimidation perk. Lone Wanderer 1 CH 3 Who needs friends, anyway? When adventuring without a companion, you take 15% less damage and carry weight increases by 50. 3 CH 3 When adventuring without a companion, you do 25% more damage. Attack Dog 1 CH 4 Your faithful canine companion can hold an enemy, giving you a greater chance to hit them in V.A.T.S. 2 CH 4 When your dog holds an enemy, there’s a chance he’ll cripple the limb he’s biting. 3 CH 4 When your dog holds an enemy, there’s a chance he’ll cause them to bleed. Animal Friend 1 CH 5 Commune with beasts! With your gun, aim at any animal below your level and gain a chance to pacify it. Local Leader 1 CH 6 As the ruler everyone turns to, you are able to establish supply lines between your workshop settlements. 2 CH 6, LVL 14 You can build stores and workstations at workshop settlements. Party Boy 1 CH 7 Nobody has a good time like you! There’s no chance you’ll get addicted to alcohol. 2 CH 7, LVL 15 The effects of alcohol are doubled. 3 CH 7, LVL 37 Your Luck is increased by 3 while you’re under the influence of alcohol. Inspirational 1 CH 8 Because you lead by example, your companion does more damage in combat, and cannot hurt you. 2 CH 8, LVL 19 Your companion resists more damage in combat, and can’t be harmed by your attacks. 3 CH 8, LVL 43 Your companion can carry more items. Wasteland Whisperer 1 CH 9 Master the post-apocalypse! With your gun, aim at any Wasteland creature below your level and gain a chance to pacify it. 2 CH 9, LVL 21 When you successfully pacify a creature, you can incite it to attack. 3 CH 9, LVL 49 When you successfully pacify a creature, you can give it specific commands. Intimidation 1 CH 10 Time to show everyone who’s boss! With your gun, aim at any human opponent below your level and gain a chance to pacify them. 2 CH 10, LVL 23 When you successfully pacify someone, you can incite them to attack. 3 CH 10, LVL 50 When you successfully pacify someone, you can give them specific commands. V.A.N.S. 1 INT 1 Let Vault-Tec guide you! The path to your closest quest target is displayed in V.A.T.S. Medic 1 INT 2 Is there a doctor in the house? Stimpaks restore 40% of lost Health, and RadAway removes 40% of radiation. 4 INT 2 Stimpaks and RadAway restore all lost health and radiation, and work much more quickly. 2 INT 4 You can hack Expert terminals. 3 INT 4 You can hack Master terminals. 4 INT 4 When hacking, you never get locked out of a terminal when things go wrong. Scrapper 1 INT 5 Waste not, want not! You can salvage uncommon components like screws, aluminum, and copper when scrapping weapons and armor. 2 INT 5 You can salvage rare components like circuitry, nuclear material, and fiber optics when scrapping weapons and armor. Items with favorited components are highlighted. Science! 1 INT 6 Take full advantage of advanced technology with access to base level and Rank 1 high-tech mods. 2 INT 6, LVL 17 You gain access to Rank 2 high-tech mods. 3 INT 6, LVL 23 You gain access to Rank 3 high-tech mods. 4 INT 6, LVL 41 You gain access to Rank 4 high-tech mods. Chemist 1 INT 7 Any chems you take last 50% longer. Far out. 2 INT 7, LVL 16 Any chems you take now last twice as long. 3 INT 7, LVL 32 Any chems you take now last an additional 150% longer. 4 INT 7, LVL 45 Any chems you take now last an additional 200% longer. Robotics Expert 1 INT 8 Machines will always serve humans, if you have anything to say about it. Hack a robot, and gain a chance to power it on or off, or initiate a self-destruct. 2 INT 8, LVL 19 When you successfully hack a robot, you can incite it to attack. 3 INT 8, LVL 44 When you successfully hack a robot, you can give it specific commands. Nuclear Physicist 1 INT 9 You’ve learned to split the atom… and command it. Radiation weapons do 50% more damage and Fusion Cores last an extra 25% longer. 2 INT 9, LVL 14 Radiation weapons now do double damage and Fusion Cores last an extra 50% longer. 3 INT 9, LVL 26 Fusion Cores can be ejected from Power Armor like devastating grenades and Fusion Cores last twice as long. Nerd Rage! 1 INT 10 Genius. Is. ANGRY! When your Health drops below 20%, time slows and you gain +20 Damage resistance and do 20% more damage while the effect lasts. 2 INT 10, LVL 31 You now gain 30 more Damage Resistance and do 30% more damage while Nerd Rage is in effect. 3 INT 10, LVL 50 You now gain 40 more Damage Resistance and do 40% more damage while Nerd Rage is in effect. Kills you make while enraged restore some lost Health. Gunslinger 1 AGI 1 Channel the spirit of the old west! Non-automatic pistols do 20% more damage. 2 AGI 1 Non-automatic pistols now do 40% more damage and have increased range. 3 AGI 1 Non-automatic pistols now do 60% more damage and range is increased even further. 4 AGI 1 Non-automatic pistols now do 80% more damage and their attacks can disarm opponents. 5 AGI 1 Non-automatic pistols now do double damage. Their attacks have a much better chance to disarm opponents, and may even cripple a limb. 2 AGI 2 Attacks with automatic weapons do 40% more damage, with improved hip fire accuracy. 3 AGI 2 Attacks with automatic weapons do 60% more damage. Hip fire accuracy is improved even more. 4 AGI 2 Attacks with automatic weapons do 80% more damage and gain a chance to stagger opponents. 5 AGI 2 Your automatic weapons now do double damage and have a greater chance to stagger opponents. Sneak 1 AGI 3 Become whisper, become shadow. You are 20% harder to detect while sneaking. 2 AGI 3 You are now 30% harder to detect while sneaking, and no longer trigger floor-based traps. 3 AGI 3 You are now 40% harder to detect while sneaking, and no longer trigger enemy mines. 4 AGI 3 You are now 50% harder to detect while sneaking, and running no longer adversely affects stealth. 5 AGI 3 Engaging stealth causes distant enemies to lose you. Mister Sandman 1 AGI 4 As an agent of death, you can instantly kill a sleeping person. Your silenced weapons do an additional 15% sneak attack damage. 2 AGI 4 Your silenced weapons do an additional 30% sneak attack damage. 3 AGI 4 Your silenced weapons now do 50% more sneak attack damage. Action Boy/Action Girl 1 AGI 5 There’s no time to waste! Action Points regenerate 25% faster. 2 AGI 5 Your Action Points now regenerate 50% faster. Moving Target 1 AGI 6 They can’t hurt what they can’t hit! Get 25+ Damage Resistance and 25+ Energy Resistance when you’re sprinting. 2 AGI 6, LVL 24 You now get +50 Damage Resistance and +50 Energy Resistance when you’re sprinting. 3 AGI 6, LVL 44 Sprinting costs 50% fewer Action Points. Ninja 1 AGI 7 Trained as a shadow warrior, your ranged sneak attack do 2.5x normal damage and your melee attacks do 4x normal damage. 2 AGI 7, LVL 16 Your ranged sneak attacks do 3x normal damage and your melee sneak attacks do 5x normal damage. 3 AGI 7, LVL 33 Your ranged sneak attacks do 3.5x normal damage and your melee sneak attacks do 10x normal damage. Quick Hands 1 AGI 8 In combat, there’s no time to hesitate. You can reload all guns faster. 2 AGI 8, LVL 23 Reloading guns costs no Action Points in V.A.T.S. Blitz 1 AGI 9 Find the gap and make the tackle! V.A.T.S. melee distance is increased significantly. 2 AGI 9, LVL 29 V.A.T.S. melee distance is increased even more, and the farther the Blitz distance, the greater the damage. Gun Fu 1 AGI 10 You’ve learned to apply ancient martial arts to gunplay! Do 25% more damage to your second V.A.T.S. target and beyond. 2 AGI 10, LVL 26 In V.A.T.S. you do 50% more damage to your third target and beyond. 3 AGI 10, LVL 50 In V.A.T.S. you instantly do a Critical Hit against your fourth target and beyond. Fortune Finder 1 LCK 1 You find more bottle caps in containers. 2 LCK 1, LVL 5 You find even more bottle caps in containers. 3 LCK 1 You find even more bottle caps in containers. 4 LCK 1, LVL 41 You find even more bottle caps in containers, and there is a chance of enemies exploding into a shower of caps when you kill them. Scrounger 1 LCK 2 You find more ammunition in containers. 2 LCK 2, LVL 7 You find even more ammunition in containers. 3 LCK 2 You find even more ammunition in containers. 4 LCK 2 You find even more ammunition in containers. Bloody Mess 1 LCK 3 +5% bonus damage means enemies will sometimes explode into a gory red paste. Watch out for flying eyeballs! 2 LCK 3, LVL 9 You now inflict +10% damage in combat. 3 LCK 3 You now inflict +15% damage in combat. 4 LCK 3 When an enemy explodes, nearby enemies may suffer the same fate. 2 LCK 4 The Mysterious Stranger appears more often in V.A.T.S. 3 LCK 4 The Mysterious Stranger appears more often in V.A.T.S. When he kills an opponent, there is a chance your Critical meter gets filled. Idiot Savant 1 LCK 5 You’re not stupid! Just… different. Randomly receive 3x XP from any action, and the lower your Intelligence, the greater the chance. 2 LCK 5 You now randomly receive 5x XP from any action. The lower your Intelligence, the greater the chance. 3 LCK 5 Randomly receiving bonus XP from any action may trigger 3x XP for all kills for a short period of time. The lower your Intelligence, the greater the chance. Better Criticals 1 LCK 6 Advanced training for enhanced combat effectiveness! Criticals do 50% more extra damage. 2 LCK 6, LVL 15 Your criticals now do twice as much extra damage. 3 LCK 6, LVL 40 Your criticals now do 2.5x as much extra damage. Critical Banker 1 LCK 7 You’re a patient battlefield tactician, and can save a Critical Hit, to be used in V.A.T.S. when you need it most. 2 LCK 7, LVL 17 You can now save 2 Critical Hits, to be used in V.A.T.S. when you need them the most. 3 LCK 7, LVL 40 You can now save 3 Critical Hits, to be used in V.A.T.S. when you need them the most. Banking a Critical has a chance to save an additional Critical. Grim Reaper’s Sprint 1 LCK 8 Death becomes you! Any kill in V.A.T.S. has a 15% chance to restore all Action Points. 2 LCK 8, LVL 19 Any kill in V.A.T.S. now has a 25% chance to restore all Action Points. 3 LCK 8, LVL 45 Any kill in V.A.T.S. has a 35% chance to restore all Action Points and refill your Critical meter. Four Leaf Clover 1 LCK 9 Feeling Lucky? You should! Each hit in V.A.T.S. has a chance of filling your Critical meter. 2 LCK 9, LVL 13 Each hit in V.A.T.S. now has an even better chance of filling your Critical meter. 3 LCK 9, LVL 32 Each hit in V.A.T.S. now has a very good chance of filling your Critical meter. 4 LCK 9, LVL 48 Each hit in V.A.T.S. now has an excellent chance of filling your Critical meter. Ricochet 1 LCK 10 What goes around comes around! Any enemy’s ranged attacks will sometimes ricochet back and instantly kill them. The closer you are to death, the higher the chance. 2 LCK 10, LVL 29 There’s an increased chance that an enemy’s shot will ricochet back and kill them. 3 LCK 10, LVL 50 When an enemy’s shot ricochets back and kills them, there is a chance your Critical meter gets filled. Perks that can be acquired by reading magazines. Barbarian None Grognak the Barbarian 10 Raises the critical damage of melee attacks.